Don't skimp on the close-out inspection and then ongoing preventive maintenance: They're the keys to a healthy, happy roof. Finally, after the project is incomplete, a few steps will help ensure a long roof life. Even though there was ongoing observation during the installation, once the installing contractor declares the project is complete, there will be at least one final Inspection. Most likely this final inspection will involve all parties invested in the project — the building owner; the architect, engineer, or roof consultant; installing contractor; and material supplier. The contractor is responsible for obtaining the material manufacturer’s specified warranty as part the contractor’s closeout package. So the contractor will schedule the final inspection with the material supplier. Their representative should provide the most detailed inspection, which will likely generate a “punch list” of corrections the contractor will have to make before they will issue the executed warranty. The building will also want to conduct a property inspection to be sure that any damage created by the roofing process is corrected by the contractor. The building owner should not provide final payment until satisfied with the results. Ongoing inspections and maintenance are critical for long-term roof life. The contractor should have used the incremental payments to pay the material suppliers; otherwise, the supplier is not likely to provide its warranty until it has been paid in full. It is important to withhold final payment to the contractor until the specified warranties have been received. Sometimes the contractor who has not yet paid the material supplier will leverage the warranty from the supplier on the premise the contractor will exchange the warranty for the final payment, which the contractor claims is necessary to pay the supplier. That is poor planning and many warranties contain language that tells the owner the warranty is in effect only after the materials have been paid in full. So while an owner may receive a warranty document, if the contractor never pays for the material or other fees invoiced to him by the manufacturer, the building owner ultimately does not have a warranty. The specification should also require the installing contractor provide its own warranty. The contractor warranty is typically specified as a 1- to 5-year obligation directly to the building owner. However, keep in mind that the manufacturer’s warranty and the contractor’s warranty run concurrently, so no matter what the contractor tells you, if a leak develops it is essential to notify the manufacturer according to their warranty terms. The value of preventive maintenance has become more recognized in recent years. Most all manufacturer warranties require the owner to perform routine maintenance to keep their warranty in effect. Some will recommend a third-party maintenance service provided by their own subsidiary or an approved contractor. If a building owner elects to do its own maintenance, it is important to have a person on staff who can recognize when and what conditions require maintenance. When maintenance is self-performed, accurate records must be maintained of when inspections and maintenance are performed. That documentation will be required by the warrantor if claim issues develop. The typical industry standard for maintenance suggest two annual inspections, one in the fall to prepare for winter and another in the spring to correct any conditions caused by winter. In addition, an inspection should be conducted after a severe storm to check for and repair damage. Basic housekeeping is an absolute necessity, especially if there are trees in the area. When leaves and debris gather at the roof drains, they block the flow of water. This can not only overload the weight capacity of the roof deck, but standing water will also have a negative effect on the life expectancy of the roof system. Most warranties exclude coverage for areas that pond water. 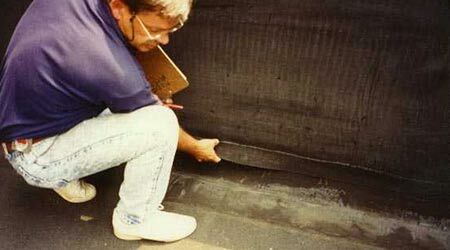 Like changing oil in your car, preventive maintenance on a roof will extend the service life of the roof asset. One final note: Be sure to maintain documentation throughout the roofing process as well as the warranty term. This will help protect the building owner’s interest should a future claim become disputed. Ron Utzler is a member of Concord Consulting Group.